After factoring and breaking down each qualifying dog food brand. Our team analyzed and ranked each brand using a ingredient quality analysis formula. This formula ranks each brand depending on ingredient quality and placement of those ingredients within the ingredient list. 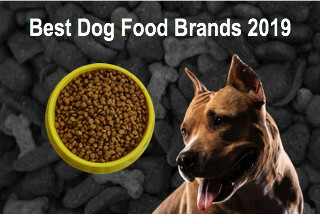 Here are the best dog food brands for 2019. Orijen is simply the best dry dog food brand available online today. Looking at the ingredient list can clearly tell why. Made out of Kentucky, Orijen Original Dry Dog Food is formulated with the highest quality of fresh whole animal ingredients. 85% of Orijen Original is comprised of poultry, fish and egg ingredients. The other 15% make up of vegetables, fruits and botanicals. Orijen Original contains zero grain, potato, tapioca and plant protein concentrates. 2/3 of the meats found in this dry dog food is considered fresh (refrigerated, without preservatives) or RAW (flash-frozen, without preservatives). While 1/3 of the meats are dehydrated at low temperatures for concentrated sources of protein. Guaranteed analysis shows a rich biologically appropriate protein level of 38% and 18% in naturally occurring non-rendered animal fats. 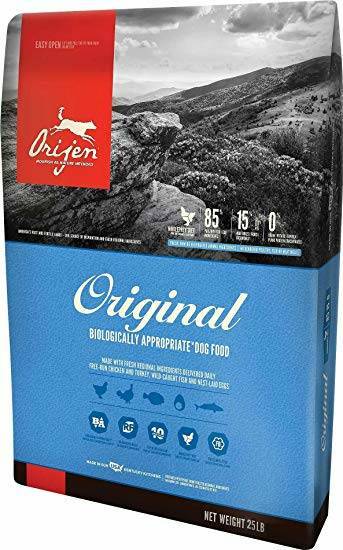 Checking out the first 15 ingredients of this 5 star rated dog food brand, clearly shows why Orijen Original is the best dry dog food brand available online. 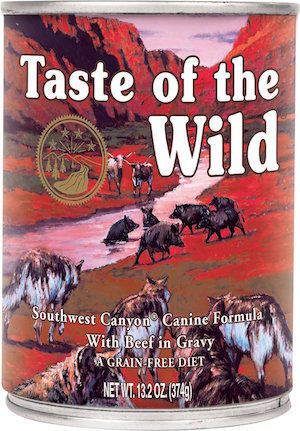 A recipe that all dogs will crave is Taste of the Wild Southwest Canyon Grain-Free Wet Dog Food. The #1 ingredient found in this 5 star wet dog food formula is real beef. This protein-rich dog food diet also includes beef liver, lamb and wild boar for lean and healthy muscles. Real peas, sweet potatoes and chickpeas flour help energize your dog while also helping with proper digestion. The prebiotic fiber and nutrients from blueberries and raspberries is perfect for any dog breed large or small. Southwest Canyon complete and balanced formula can also be fed as your dog’s sole diet. This highly digestible diet contains a 9.0% protein level and 4.0% crude fat level. Taste of the Wild wet dog food product can be found online and on retailer shelves nationwide. Ingredients: Beef, Beef Broth, Vegetable Broth, Beef Liver, Dried Egg Product, Peas, Potato Starch, Lamb, Wild Boar, Chickpea Flour, Guar Gum, Tricalcium Phosphate, Natural Flavor, Sunflower Oil, Sodium Phosphate, Salt, Potassium Chloride, Inulin, Tomatoes, Sweet Potatoes, Blueberries, Raspberries, Flaxseed Oil (Preserved With Mixed Tocopherols), Choline Chloride, Yucca Schidigera Extract, Fish Oil (Preserved With Mixed Tocopherols), Zinc Amino Acid Chelate, Iron Amino Acid Chelate, Vitamin E Supplement, Copper Amino Acid Chelate, Manganese Amino Acid Chelate, Sodium Selenite, Thiamine Mononitrate, Cobalt Amino Acid Chelate, Niacin Supplement, D-Calcium Pantothenate, Vitamin A Supplement, Riboflavin Supplement, Biotin, Vitamin B12 Supplement, Potassium Iodide, Pyridoxine Hydrochloride, Vitamin D3 Supplement, Folic Acid, Rosemary Extract. This biologically appropriate, regionally inspired, grain-free dry dog food features free-run deboned chicken as the #1 ingredient. Made out of Kentucky USA, Acana Meadowland contains 70% free-run poultry and fish ingredients and 30% vegetables, fruits and botanicals. Additionally, Acana is grain-free and has no potatoes, tapioca, gluten or any other plant protein concentrates. In addition to deboned chicken as the #1 ingredients, Acana Meadowland also contains an array of protein-rich ingredients including; deboned turkey, chicken liver, turkey giblets, chicken meal, catfish meal, whole red lentils, rainbow trout, blue catfish, chicken heart and whole pinto beans. This protein packed ingredient list gives Acana Meadowland a above AAFCO standard 33.0% min protein level. 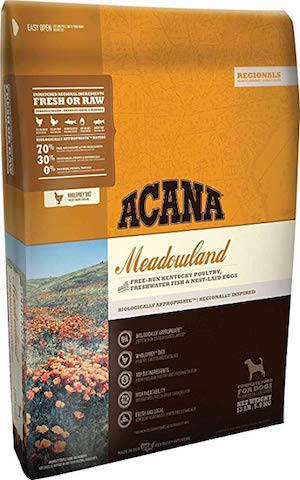 If you are looking for a ultra-premium grain-free dry dog food brand Acana Meadowland is it. Ingredients: Deboned chicken, deboned turkey, chicken liver, turkey giblets, chicken meal, catfish meal, whole red lentils, whole pinto beans, whole green peas, pollock meal, chicken fat, whole green lentils, whole chickpeas, lentil fiber, whole blue catfish, whole eggs, rainbow trout, pollock oil, natural chicken flavor, chicken heart, chicken cartilage, whole pumpkin, whole butternut squash, mixed tocopherols (preservative), sea salt, zinc proteinate, dried kelp, calcium pantothenate, kale, spinach, mustard greens, collard greens, turnip greens, whole carrots, whole apples, whole pears, freeze-dried chicken liver, freeze-dried turkey liver, pumpkin seeds, sunflower seeds, copper proteinate, chicory root, turmeric, sarsaparilla root, althea root, rosehips, juniper berries, dried lactobacillus acidophilus fermentation product, dried bifidobacterium animalis fermentation product, dried lactobacillus casei fermentation product. Zignature Trout & Salmon is a grain-free, pate texture, 5 star wet dog food brand. 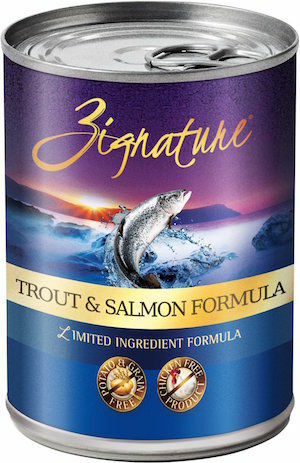 The formula is made up of trout and salmon from Northwestern USA. The trout provides a high-quality protein which is full of Omega-3 fatty acids. Additionally, the trout is full of vitamin B12 as well as niacin, B6, phosphorus and selenium. Further down the ingredient list peas and chickpeas round out this limited 8 ingredient grain-free diet. If you’re looking for a ultra-premium grain-free wet dog food brand, take a look at Zignature’s product line. Ingredients: Trout, Fish Broth, Salmon, Peas, Chickpeas, Agar-Agar, Calcium Carbonate, Salmon Meal, Suncured Alfalfa Meal, Carrots, Potassium Chloride, Salt, Choline Chloride, Cranberries, Blueberries, Minerals (Zinc Proteinate, Iron Proteinate, Copper Proteinate, Manganese Proteinate, Sodium Selenite, Calcium Iodate), Vitamins (Vitamin E Supplement, Thiamine Mononitrate, Niacin Supplement, Calcium Pantothenate, Biotin, Vitamin A Supplement, Riboflavin Supplement, Vitamin B12 Supplement, Pyridoxine Hydrochloride, Vitamin D3 Supplement, Folic Acid). Packed full of premium meats, I and Love and You focuses on premium all-natural ingredients for any growing pup. 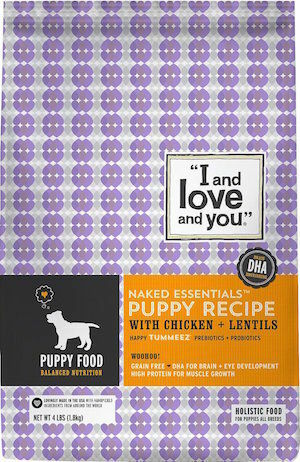 Chicken is the #1 ingredient found in I and Love and You Naked Essential Puppy Recipe. Additionally, chicken meal, menhaden fish meal, peas, lentils, pea starch, pea protein and chickpeas also found in this premium puppy food. Proudly made in the USA, I and Love and You is free of unwanted fillers, corn, wheat, soy and animal by-products. Furthermore, I and Love and You is an excellent source of protein and for active puppy growth. Gentle on digestive systems, I and Love and You uses probiotics and probiotics for optimum digestive health. Ingredients compared to price I and Love and You is a clear winner for any health conscious puppy owner. Ingredients: chicken, chicken meal, menhaden fish meal, peas, lentils, pea starch, pea protein, chickpeas, chicken fat (preserved with mixed tocopherols), dried sweet potatoes, dried beet pulp, flaxseed meal, turkey meal, dried eggs, salt, fish oil, choline chloride, dried carrots, dried chicory root, Vitamin E supplement, dried Lactobacillus acidophilus fermentation product, dried Lactobacillus casei fermentation product, dried Bifidobacterium thermophilum fermentation product, dried Enterococcus faecium fermentation product, zinc sulfate, iron amino acid chelate, ferrous sulfate, zinc amino acid chelate, Vitamin A supplement, copper sulfate, manganese amino acid chelate, Vitamin D3 supplement, niacin, d-calcium pantothenate, manganous oxide, sodium selenite, pyridoxine hydrochloride, copper amino acid chelate, riboflavin supplement, folic acid, Vitamin B12 supplement. Comparing price, ingredient quality and guaranteed analysis Chicken Soup for the Soul Wet Puppy Food is the winner. Take a look at the meat sources in this 5 star wet puppy food. Chicken, chicken liver, turkey, duck and salmon are all found within the first 10 ingredients in Chicken Soup for the Soul wet puppy food. Additionally, brown rice, oatmeal, carrots, peas, potatoes, flaxseed, ground barley and dried egg product are slow cooked to lock in the natural goodness and flavor. Rich antioxidants help promote overall puppy health and energy as well. Formulated for small, medium and large breed puppies this pate wet puppy food is palatable for any dog breed. 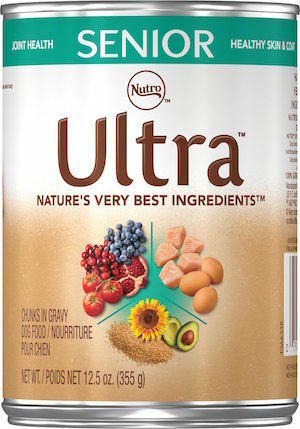 Ingredients: Chicken, Chicken Liver, Turkey, Chicken Broth, Turkey Broth, Duck, Salmon, Whole Grain Brown Rice, Oatmeal, Carrots, Peas, Potatoes, Flaxseed, Ground Barley, Dried Egg Product, Fish Oil (Preserved With Mixed Tocopherols), Potassium Chloride, Salt, Apples, Cranberries, Dried Kelp, Cassia Gum, Xanthan Gum, Inulin, Vitamins (Thiamine Mononitrate, Vitamin E Supplement, Niacin Supplement, D-Calcium Pantothenate, Vitamin A Supplement, Riboflavin Supplement, Biotin, Vitamin B12 Supplement, Pyridoxine Hydrochloride Vitamin D3 Supplement, Folic Acid), Minerals (Ferrous Sulfate, Zinc Oxide, Copper Proteinate, Sodium Selenite, Manganese Sulfate, Potassium Iodide), Yucca Schidigera Extract, Choline Chloride, Tricalcium Phosphate, Parsley, Rosemary Extract. Specially formulated for dogs 7 years or older, Precise Holistic is one of the best senior dry dog food brands available online. This holistic recipe includes chicken, lamb and salmon meal for a concentrated nutritional diet that’s highly digestible for senior dogs. Holistic Select uses cutting-edge science and technology to help source all-natural ingredients in every brand they sell. 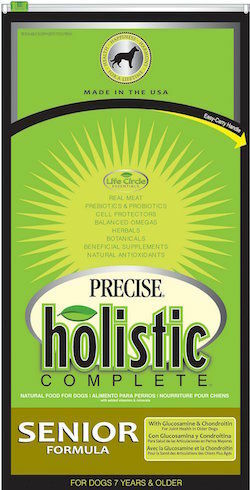 Prebiotics and probiotics is added to the kibble for healthy digestion and balanced essential omega fatty acids from chicken fat, flaxseed and fish oil to help promote healthy skin/coat. Additionally, Yucca Schidilgera is included to recuse stool odor and glucosamine to help support hip and joint health. Carrots, blueberries, cranberries and kelp are also included and help provide important vitamins and minerals that help with overall senior health. Made in the USA, Precise Holistic Complete Senior Formula is a wonderful choice for any small, medium and large breed senior dog. Ingredients: Chicken, Chicken Meal, Ground Brown Rice, Oatmeal, Lamb Meal, Chicken Fat (Preserved with Mixed Tocopherols and Ascorbyl Palmitate), Salmon Meal, Citrus Fiber, Tomato Pomace, Flaxseed, Dried Egg Product, Rice Bran, Natural Flavor, Fat Product (Natural Source of Omega-3 DHA from Algae), Lecithin, Menhaden Fish Oil, Chicken Cartilage (Source of Glucosamine and Chondroitin Sulfate), Dried Kelp, Peas, Dried Apples, Dried Carrots, Dried Cranberries, Dried Blueberries, Chamomile, Dandelion, Peppermint, Rosemary, Turmeric, Bacillus Coagulans Gbi-30 6086, Chicory Root (a Source of Inulin), Potassium Chloride, Choline Chloride, Yucca Schidigera Extract, Taurine, L-Carnitine, Calcium Ascorbate (Source of Vitamin C), Zinc Amino Acid Chelate, Iron Amino Acid Chelate, Biotin, Manganese Amino Acid Chelate, Cobalt Amino Acid Chelate, Calcium Carbonate, Salt, Vitamin E Supplement, Vitamin A Supplement, Calcium Pantothenate, Niacin, Pyridoxine Hydrochloride (B6), Thiamine Mononitrate (B1), Vitamin B12 Supplement, Vitamin D3 Supplement, Riboflavin Supplement, Dl-Methionine, Copper Amino Acid Chelate, Folic Acid, Selenium Yeast, Calcium Iodate. Nutro Ultra Senior Chunks Wet Dog Food is packed with an array of locally sourced animal ingredients. Chicken, chicken liver, lamb liver, lamb, salmon and turkey are all found within the first 10 ingredients of Nutro Ultra Senior. 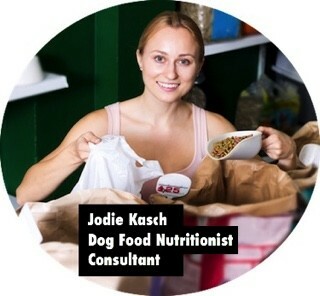 Additionally, the company’s dog food experts include naturally sourced glucosamine and chondroitin for healthy cartilage. The team also includes a optimized fiber balance that promotes an ideal digestive system. The chunks in gravy wet food is made without any artificial colors, flavors or preservatives. 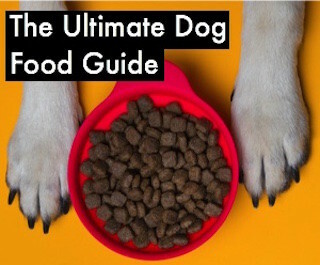 Designed fir small, medium and large breed senior dogs Nutro Ultra Senior Chunks Wet Dog Food is a great choice for any 7+ year old senior dog. Ingredients: Chicken Broth, Chicken (source of glucosamine and chondroitin sulfate), Chicken Liver, Potato Starch, Wheat Gluten, Lamb Liver, Lamb, Salmon, Turkey, Ground Rice, Dried Egg Product, Dried Plain Beet Pulp, Whole Brown Rice, Dried Peas, Dried Carrots, Whole Grain Oatmeal, Guar Gum, Ground Flaxseed, Sodium Phosphate, Dehydrated Alfalfa Meal, Tomato Pomace, Sunflower Oil (preserved with mixed Tocopherols), Salt, Potassium Chloride, Natural Flavors, Calcium Carbonate, Blueberry Pomace, Cranberry Pomace, Tricalcium Phosphate, Iron Proteinate, Sodium Alginate, Xanthan Gum, Dried Avocado, Dried Pomegranate, Zinc Proteinate, Dried Pumpkin, Vitamin E Supplement, Dried Spinach, Choline Chloride, Ascorbic Acid, Beta Carotene Color, Taurine, Thiamine Mononitrate (Vitamin B1), Zinc Oxide, Magnesium Sulfate, Copper Proteinate, Manganese Proteinate, Cobalt Proteinate, Sodium Selenite, Potassium Iodine, Biotin, Vitamin A Supplement, Vitamin D3 Supplement, Vitamin B12 Supplement, Riboflavin Supplement. 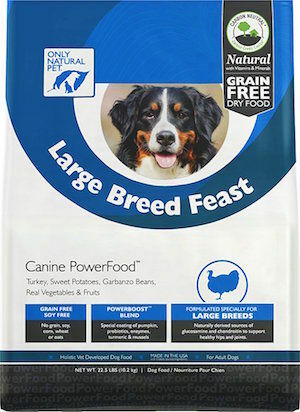 Deboned turkey, turkey meal and chicken meal are the first 3 ingredients found in Only Natural Pet Canine PowerFood Large Breed Feast Dry Dog Food. Holistically formulated, the quality proteins are designed to help large breed dogs with slower metabolism. Complex carbohydrates such as sweet potatoes and garbanzo beans provide energy and help maintain a healthy weight in your large breed dog. Additionally, glucosamine and chondroitin are included to help support healthy hips and joints. Only Natural Pet uses an exclusive PowerBoost blend which is an array of superfood ingredients which include; probiotics, digestive enzymes, pumpkin and green-lipped muscles. The exclusive blend provides enough nutritional benefits to support a health lifestyle for your dog. 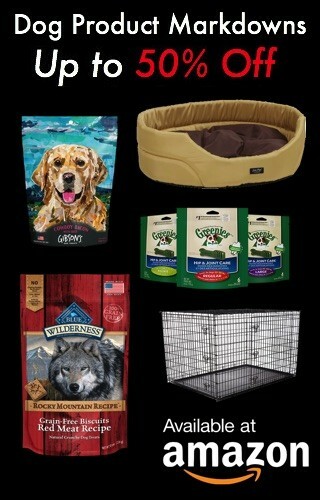 Only Natural Pet is made in the USA and globally sources their ingredients. Furthermore, there’s no grains, artificial flavors, colors or fillers. Ingredients: Deboned Turkey, Turkey Meal, Chicken Meal, Sweet Potato, Garbanzo Beans, Pea Protein, Chicken Fat (Preserved With Mixed Tocopherols), Chicken Cartilage (Source Of Glucosamine And Chondroitin Sulfate), Sun Cured Alfalfa, Herring Oil, Freeze Dried Peas, Flaxseed, Natural Flavor, Dried Chicory Root, Dried Apples, Dried Carrots, Dried Cranberries, Tomato Pomace, Dried Kelp, Potassium Chloride, Vitamins [Vitamin A Supplement, Vitamin D3 Supplement, Vitamin E Supplement, Calcium Pantothenate, Niacin Supplement, Riboflavin Supplement, Vitamin B12 Supplement, Thiamine Mononitrate, Pyridoxine Hydrochloride, Folic Acid], Minerals[Zinc Proteinate, Calcium Carbonate, Iron Proteinate, Copper Proteinate, Manganese Proteinate, Sodium Selenite, Calcium Iodate], Pumpkin, Dried Enterococcus Faecium Fermentation Product, Dried Lactobacillus Acidophilus Fermentation Product, Dried Aspergillus Oryzae Fermentation Product (Source Of Amylase, Lipase And Protease), Dried Aspergillus Niger Fermentation Extract, Dried Trichoderma Longibrachiatum Fermentation Extract, Dried Bacillus Subtilis Fermentation Extract, Pineapple Stems (Source Of Bromelain), Taurine, L-Carnitine, Ascorbic Acid (Source Of Vitamin C), New Zealand Green Mussels, Turmeric, Rosemary Extract. Taking a look at the ingredient list, you will find out why Chicken Soup for the Soul is the #1 best wet dog food brand for large breed dogs. The first 2 main ingredients are real chicken and turkey meat. Additionally, within the first 7 ingredients are duck, salmon and chicken liver as well. The mixture of protein-rich lean meats are simmered in turkey and chicken broth to provide a flavorful, nutrient-power packed wet dog food. This 5 star wet dog food also featured antioxidants such as zinc, vitamin E, and selenium to promote optimum health performance. Chicken Soup for the Soul Adult Wet Dog Food is nutritionally balanced and is one of the best wet dog food options for your large breed dog. 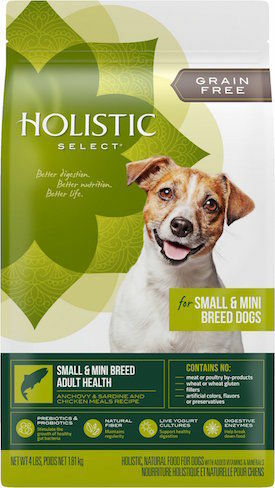 Holistic Select Small & Mini Breed is one of the best small breed dry dog food brands available online today. The 35.0% min protein level makes this a protein rich diet for the most active, energy filled small dog breed. The formula is designed for small, extra small and toy breeds and is grain-free for the most sensitive of digestion. The kibble is calorie dense, for the highest metabolism in the smallest of dogs. Additionally, this brand is filled with natural fibers and antioxidant rich superfoods such as, pomegranate and blueberries to help support health on the cellular level. The high quality ingredients helps support the absorption of rich nutrients to nourish your small breed dog’s entire body. 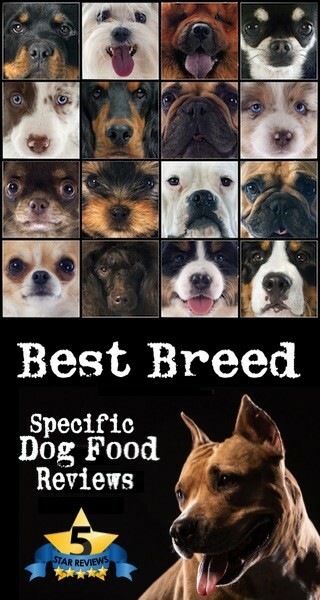 If you are looking the best brand of small breed dry dog food, Holistic Select is the winner. Ingredients: Anchovy and Sardine Meal, Chicken Meal, Peas, Chickpeas, Chicken Fat (preserved with Mixed Tocopherols), Dried Plain Beet Pulp, Flaxseed, Pumpkin, Salmon Oil, Cranberries, Apples, Brewers Dried Yeast, Salt, Papayas, Choline Chloride, Blueberries, Pomegranates, Vitamin E Supplement, Inulin, Dried Kelp, Zinc Proteinate, Mixed Tocopherols added to preserve freshness, Zinc Sulfate, Niacin, Ferrous Sulfate, Iron Proteinate, Vitamin A Supplement, Yucca Schidigera Extract, Ascorbic Acid (Vitamin C), Ground Cinnamon, Ground Fennel, Ground Peppermint, Copper Sulfate, Thiamine Mononitrate, Copper Proteinate, Manganese Proteinate, Manganese Sulfate, d-Calcium Pantothenate, Sodium Selenite, Dried Enterococcus faecium Fermentation Product, Pyridoxine Hydrochloride, Riboflavin, Vitamin D3 Supplement, Biotin, Dried Lactobacillus bulgaricus Fermentation Product, Dried Enterococcus thermophilus Fermentation Product, Calcium Iodate, Vitamin B12 Supplement, Folic Acid, Dried Bacillus licheniformis Fermentation Product, Dried Bacillus subtilis Fermentation Product, Dried Aspergillus oryzae Fermentation Product, Dried Trichoderma reesei Fermentation Product, Dried Rhizopus oryzae Fermentation Product, Dried Lactobacillus acidophilus Fermentation Product, Dried Lactobacillus casei Fermentation Product, Rosemary Extract, Green Tea Extract, Spearmint Extract. 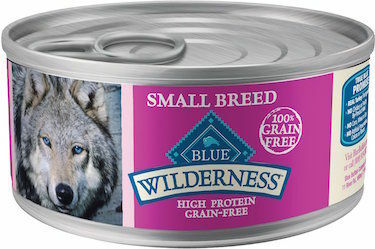 Blue Buffalo Wilderness Small Breed Turkey & Chicken Grill is a high protein, low carbohydrate wet food that your small breed dog will love. Turkey and chicken are the #1 and #2 ingredients in this 5 star small breed wet dog food brand. Made without any grain, corn, wheat, soy, preservatives or by-products, Blue Buffalo is a wonderful choice for the most sensitive of small breed dogs. Additionally, B12 supplement and flaxseed is added to boost gastrointestinal function and overall immune system. The pate texture is designed for small, extra small and toy breed dogs as well. If your adult small breed dog is healthy and active, Blue Buffalo is a great choice at a reasonable price. Ingredients: Turkey, Chicken, Chicken Broth, Turkey Liver, Potatoes, Flaxseed, Guar Gum, Carrageenan, Cassia Gum, Potassium Chloride, Salt, Choline Chloride, Zinc Amino Acid Chelate, Iron Amino Acid Chelate, Vitamin E Supplement, Copper Amino Acid Chelate, Manganese Amino Acid Chelate, Sodium Selenite, Thiamine Mononitrate (Vitamin B1), Cobalt Amino Acid Chelate, Niacin Supplement (Vitamin B3), Calcium Pantothenate (Vitamin B5), Vitamin A Supplement, Riboflavin Supplement (Vitamin B2), Biotin (Vitamin B7), Vitamin B12 Supplement, Potassium Iodide, Pyridoxine Hydrochloride (Vitamin B6), Vitamin D3 Supplement, Folic Acid (Vitamin B9). 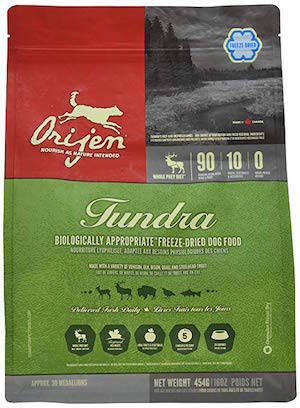 Taking a look at the ingredient list it’s no wonder Orijen Tundra best freeze-dried dog food brand available online. Chicken, turkey, whole herring, chicken liver and chicken heart are the first 5 main ingredients found this ultra-premium freeze-dried dog food. The nutrient-rich formula contains Wholeprey ratios of meats, organs, cartilage, and bones. These healthy wholesome ingredients are the foundation of Orijen dog foods, all meats are delivered fresh or raw without preservatives, then gently freeze-dried. In addition to protein-packed ingredients, Orijen blends antioxidant rich fruits and heart-healthy vegetables as well. Orijen Adult Freeze-Dried Dog Food is low-glycemic, helps maintain proper digestion health and contains limited carbohydrates. Ingredients: Venison (ground with bone), duck (ground with bone), whole steelhead trout, bison (ground with bone), elk (ground with bone), quail (ground with bone), duck liver, duck heart, spinach greens, pea fiber, bison tripe, elk liver, elk heart, elk kidney, whole ground sunflower seeds, whole pumpkin, butternut squash, whole carrots, whole cranberries, whole blueberries, whole blackberries, apples, pears, plums, apricots, brown kelp, mixed tocopherols (preservative), chicory root, dandelion root, summer savory, peppermint leaf, ginger root, iron proteinate, zinc proteinate, manganese proteinate. 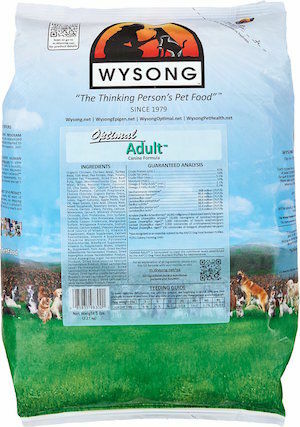 Developed by Veterinarian Dr. Wysong, Wysong Optimal Adult Dry Dog Food is a super premium dry dog food brand that is perfect for dogs with diabetes. The 5 star formula has very low levels of carbohydrates, a low glycemic index and a superb protein level (42.0%). A protein-dense formula, Wysong Optimal is made up of organic chicken, chicken meal, turkey meal and fish meal all of which are found in the first 5 ingredients. Additional ingredients including peas, potatoes, flaxseed, eggs and chia seeds are also added. The entire formula includes 42% fresh/frozen ingredients as well as a outstanding spectrum of micronutrients, including adult life stage specific nutraceuticals. Ingredients: Organic Chicken, Chicken Meal, Turkey Meal, Fish Meal, Pea Protein, Peas, Potato, Chicken Fat, Flaxseeds, Dried Plain Beet Pulp, Eggs, Montmorillonite Clay, Crab Meal, Whey, Natural Chicken and Fish Flavor, Coconut Oil, Chia Seeds, Salt, Calcium Carbonate, Tomato Pomace, Calcium Propionate, Choline Chloride, Organic Barley Grass, Blueberry, Dried Kelp, Yogurt, Apple Pectin, Fish Oil, Yeast Extract, Citric Acid, Chicory Root, Hemicellulose Extract, Mixed Tocopherols, Rosemary Extract, Yeast Culture, Carrots, Celery, Beets, Parsley, Lettuce, Watercress, Spinach, Minerals (Potassium Chloride, Zinc Proteinate, Zinc Sulfate, Ferrous Sulfate, Iron Proteinate, Copper Sulfate, Copper Proteinate, Manganese Sulfate, Manganese Proteinate, Sodium Selenite, Calcium Iodate), Vitamins (Ascorbic Acid [Source of Vitamin C], Vitamin E Supplement, Niacin Supplement, Calcium Pantothenate, Vitamin A Supplement, Thiamine Mononitrate, Pyridoxine Hydrochloride, Riboflavin Supplement, Vitamin D3 Supplement, Biotin, Vitamin B12 Supplement, Folic Acid), Dried Bacillus Licheniformis Fermentation Product, Dried Aspergillus Oryzae Fermentation Product, Dried Aspergillus Niger Fermentation Product, Dried Enterococcus Faecium Fermentation Product, Dried Lactobacillus Casei Fermentation Product, Dried Lactobacillus Acidophilus Fermentation Product, Dried Bacillus Subtilis Fermentation Product, Dried Lactobacillus Plantarum Fermentation Product, Dried Lactobacillus Lactis Fermentation Product, Pepper. Wellness Complete Health Healthy Weight Formula is a reduced calorie diet made with deboned chicken, chicken meal, oatmeal, brown rice, barley and peas. Flaxseed, spinach, apples, blueberries and sweet potatoes compliment the protein-rich low-fat diet as well. 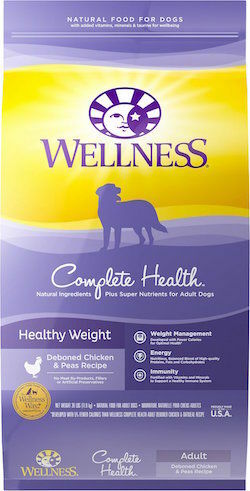 The 5 star low-fat dog food promotes weight control, healthy brain and heart function, as well as hip and joint health. Per guaranteed analysis this low-fat formula exceeds AAFCO standards with a 24.0% min protein level and 10.0% min fat level. This satisfying dry dog food is filling from healthy fiber, and also contains yucca schidigera extra which helps reduce odor in stool. Ingredients: Deboned Chicken, Chicken Meal, Oatmeal, Ground Brown Rice, Ground Barley, Peas, Tomato Pomace, Rice, Ground Flaxseed, Tomatoes, Chicken Fat, Carrots, Natural Chicken Flavor, Potassium Chloride, Choline Chloride, Spinach, Vitamin E Supplement, Taurine, Zinc Proteinate, Mixed Tocopherols Added to Preserve Freshness, Sweet Potatoes, Apples, Blueberries, Zinc Sulfate, Calcium Carbonate, Niacin, Ferrous Sulfate, Iron Proteinate, Vitamin A Supplement, Glucosamine Hydrochloride, Chondroitin Sulfate, Ascorbic Acid (Vitamin C), Copper Sulfate, Thiamine Mononitrate, Copper Proteinate, Chicory Root Extract, Manganese Proteinate, Manganese Sulfate, D-Calcium Pantothenate, Sodium Selenite, Pyridoxine Hydrochloride, Riboflavin, Yucca Schidigera Extract, Garlic Powder, Vitamin D3 Supplement, Biotin, Calcium Iodate, Vitamin B12 Supplement, Folic Acid, Dried Lactobacillus Plantarum Fermentation Product, Dried Enterococcus Faecium Fermentation Product, Dried Lactobacillus Casei Fermentation Product, Dried Lactobacillus Acidophilus Fermentation Product Rosemary Extract, Green Tea Extract, Spearmint Extract. 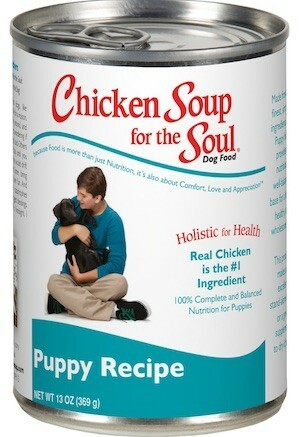 If you are looking for the best dry dog food for the price check out Chicken Soup for the Soul. 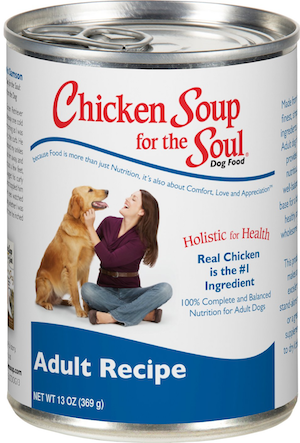 The popular book series turned dog food supplier, Chicken Soup for the Soul provides a high quality dry dog food brand at an affordable price. This holistic, nutritious kibble is made with protein-dense chicken, turkey, chicken meal and turkey meal which gives the formula a 26.0% min protein level. Additionally, Chicken Soup for the Soul includes wholesome vegetables, antioxidant-rich fruits and healthy whole grains for added energy. Complex carbohydrates found help sustain active adult dog energy levels and the essential fats supply natural Omega-3 fatty acids to help promote healthy skin and coat. L-Carnitine is also added and helps boost metabolism and helps burn fat as well. 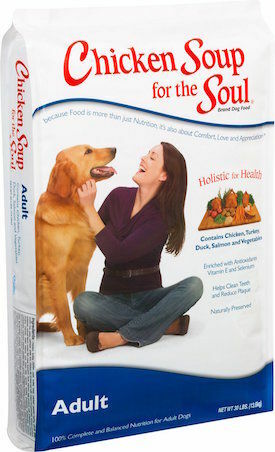 If you are on a budget and looking for the best dry dog food brand for the price, Chicken Soup for the Soul is a clear winner. Ingredients: Chicken, Turkey, Chicken Meal, Turkey Meal, Cracked Pearled Barley, Whole Grain Brown Rice, Peas, Oatmeal, White Rice, Chicken Fat (Preserved With Mixed Tocopherols), Potatoes, Natural Flavor, Tomato Pomace, Ocean Fish Meal, Flaxseed, Duck, Salmon, Egg Product, Salt, Potassium Chloride, Choline Chloride, Dried Chicory Root, Dried Kelp, Carrots, Apples, Tomatoes, Blueberries, Spinach, Cranberries, Rosemary Extract, Parsley Flake, Vitamin E Supplement, Zinc Oxide, Thiamine Mononitrate, Yucca Schidigera Extract, Zinc Proteinate, L-Carnitine, Ferrous Sulfate, Manganous Oxide, Vitamin A Supplement, D-Calcium Pantothenate, Copper Sulfate, Manganese Proteinate, Niacin Supplement, Calcium Iodate, Riboflavin Supplement, Dried Lactobacillus Acidophilus Fermentation Product, Dried Lactobacillus Casei Fermentation Product, Dried Lactobacillus Plantarum Fermentation Product, Dried Enterococcus Faecium Fermentation Product, Copper Proteinate, Pyridoxine Hydrochloride, Vitamin D3 Supplement, Folic Acid, Sodium Selenite, Biotin, Vitamin B12 Supplement, Cobalt Carbonate. If you are whits end on getting your picky dog to eat the food you sit out, you need to try ORIJEN Red Freeze-Dried Dog Food. 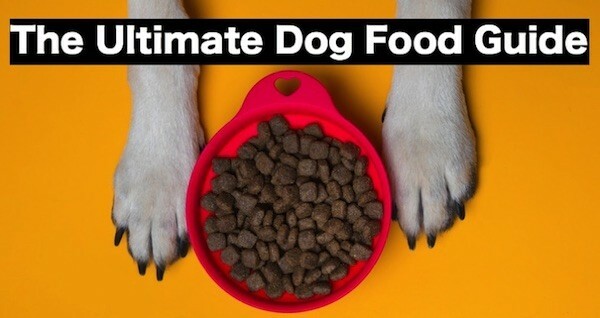 This 5 star ultra-premium freeze-dried dog food is packed with 90% meat ingredients. 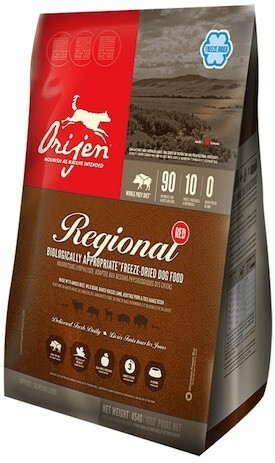 Locally and ranch raised black angus beef, wild boar, lamb, pork and bison are all included in ORIJEN Regional Red. Additionally, antioxidant rich fruits, wholesome vegetables, and essential vitamins & minerals make up the remaining 10% of the biologically appropriate diet. If you are looking for the most flavorful diet that closely mimics the wild, check out ORIJEN Red Freeze-Dried. Ingredients: Angus beef (ground with bone)*, wild boar (ground with bone) *, lamb (ground with bone) *, whole herring*, bison (ground with bone) *, beef liver*, spinach*, pea fiber, lamb liver*, pork liver*, beef heart*, lamb heart*, beef tripe*, whole salmon*, sunflower seeds, Red Delicious apples*, Bartlett pears*, Red Heart plums*, Tilton apricots*, pumpkin*, Butternut squash*, Imperator carrots*, kelp*, mixed tocopherols, cranberries*, blueberries*, blackberries*, chicory root, dandelion root, summer savory, peppermint leaf*, ginger root*, iron proteinate, zinc proteinate, manganese proteinate.